Frequently, popular songs end up linked in my mind to specific places. LMFAO's "Party Rock Anthem" always takes me back to celebrating Eric's 30th birthday at the Blue Note Club on Ios (and a fantastic "Parks and Recreation" cold open). "Young Folks" makes me think of the coffee shop in Philadelphia where I worked as a line cook for a summer. During our nine months abroad, I ended up with my own personal mix CD of music I now associate with our trip. Almost all of the songs are in English — no one is kidding when they talk about American culture being exported overseas. I hope you enjoy this as much as I do, and please don't judge too harshly. Since returning to the United States, a lot of people have asked me, "So, how was your trip?" Sometimes this is followed by, "Tell me everything!" I answer, "It was great!" and then there's an awkward pause because I have no idea what else to say. How do I summarize the past year? and yet they're still hard to caption all at once. Most of the time, I list the countries we visited. People ask which was my favorite, and I pick a different one every time. I talk about some of the people we met, my favorite cities, or the delicious food. I have so many stories, but it's hard to bring them up all the time. 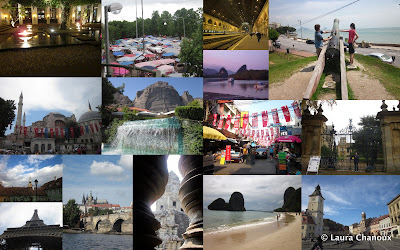 There are also only so many times I can segue with: "Speaking of Indonesia..."
We flew to Turkey in August and from there traveled through Greece, Italy, the Czech Republic, France, the United Kingdom, Hungary, Romania and Germany. Here are my favorite photos from the second half of the trip! In May, I posted my favorite photos from our first two months of traveling. By that point, we'd visited Cambodia, Thailand and Malaysia. Since getting back, I have been sorting through my many, many pictures and wanted to share my favorites from the trip as a whole. I'm breaking the post up into two parts, Asia and Europe, to try to make it a manageable length. I hope you like these as much as I do! Eric and I spent a lot of time in coffee shops around the world. I was impressed everywhere we went with how pretty a cappuccino can be. Here's a round-up of some of the most attractive coffee I had the opportunity to drink. We spent the last three days of our trip in Berlin. In retrospect, it was an extreme contrast to the first city we visited, Phnom Penh. Berlin is remarkably clean and organized. Phnom Penh is crowded and overwhelming. We started in humid summer weather and ended in chilly winter. However, both cities have their histories constantly on display. In Berlin, it seemed that every turn took us to a new monument or plaque commemorating World War II or the division of the city during the Cold War. Unlike some cities that would have tried to separate from and leave behind a dark past, Berlin and its citizens have committed to never forgetting. The Reichstag building is one of the most remarkable government buildings I've ever seen. Eric and I visited the remains of the Berlin Wall and the museum Topography of Terror. We walked by the Holocaust Memorial and Checkpoint Charlie. We met a lot of German people when we were at one hostel in Malaysia, and they all had different opinions on this infusion of historical memory into modern national identity.